GSEB HSC Science Sem 3 Answer Key 2016: The Gujarat Secondary and Higher Secondary Education Board (GSEB) going to conduct 12th Science Semester 3 Examination form today. Total 1,39,682 students are registered in the Sem-3 examination. Candidates who have appeared for GSEB HSC Sem 3 exam 2015 can download GSEB HSC Science Sem 3 Answer Key 2016 which will be released soon. Gujarat Secondary and Higher Secondary Education Board Education Department – Government of Gujarat conducted HSC Science Sem 3 Examination in the month of October at various centers all over the state. The official 12th Sem 3 Answer Key 2016 will be declare within 15 days of the examination date. The Gujarat Secondary and Higher Secondary Education Board is a government of Gujarat body responsible for conducting examinations, research and development. The GSEB conducts two main examinations – The Secondary School Certificate (SSC) exam for Class 10 and the Higher Secondary Certificate (HSC) for Class 12 students in Gujarat. Gujarat HSC Science SEM 3 Exam Answer Key 2016 is very soon available for download at the Main Authority Website www.gseb.org. Applicants those who has appeared for the Written exam process are now keep waiting and searching for the hsc science sem 3 paper solution 2016. 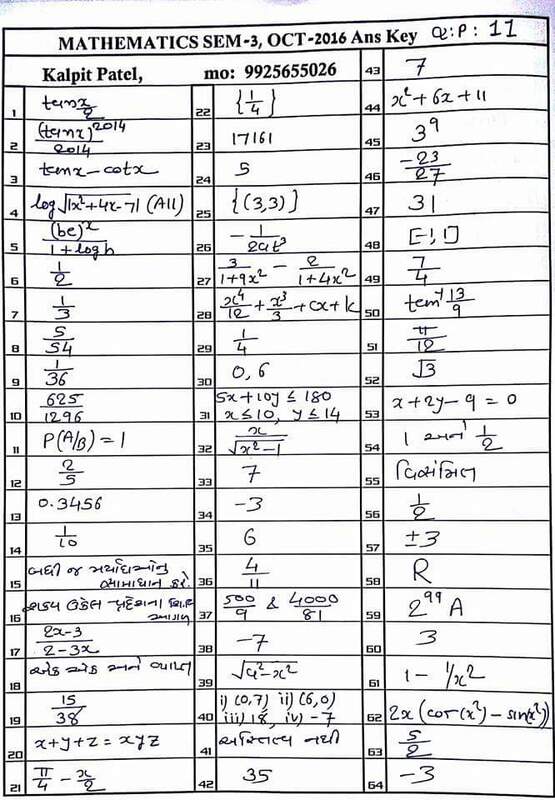 The students can check the answer key for HSC semester 3 of Maths, Physics, Chemistry, Biology, English, Sanskrit and Computer examination. Visit the official website, the link for which is www.gseb.org. Click on the link HSC Sem-3 Oct 2016 Answer Key. The Official Answer Key will be soon updated by the Gujarat Board Secondary and Higher Secondary Education board at the official website www.gseb.org. But before that the NIB School Palanpur have provided the GSEB HSC Science Sem 3 Answer Key 2016. Pls….. chemistry sem 3 answer key.. When u give us English answer key??? ?plz fast..
please recheck the question no.31 ? Jaldi answer key moklo A1 Khabar Padi Jay. Kayare aavse English ni answer key???? Chemistry and English answer key pleas..
tapan sir chemistry ni answerkey ma bhul chhe…. paperset 10 ma mcq no.31&32. correct answer is D&C chhe to please chek one mode time answer key…. Please fast upload physics and English answer key.. Please upload physics answer Kay as soon as possible……. Please upload English answer key …. Please upload Biology Answer key…. Please upload Biology Answer key….. Please computer ni answer key muko tamari wab site ma. Board answerkey kyare avse ????? Physics set 8 question 10 is false please reply….. Please chemistry set no 8 answerkey plz…. PleasePlease biology set no 8 answerkey plz….